As "yellow vest" demonstrators staged anti-government protests for the 20th consecutive weekend this Saturday, turnout appeared to be in decline compared to last week. The French Interior Ministry counted some 33,700 protesters throughout the country, including 4,000 in Paris. Last week, the Ministry said there were 40,500 demonstrators nationwide including 5,000 in the capital. Yellow vest protesters have repeatedly challenged the figures provided by the government. In an attempt to contain violence, authorities have banned demonstrations in certain areas including the Champs Elysees avenue in Paris, the surroundings of the National Assembly and the centre of Bordeaux. Demonstrators who brave the ban face a 135 euros fine. "We are coming for the same reasons as on November 17 (the first day of protests). We did not get anything," said Nadine, a social worker taking part in the Paris protests this Saturday. 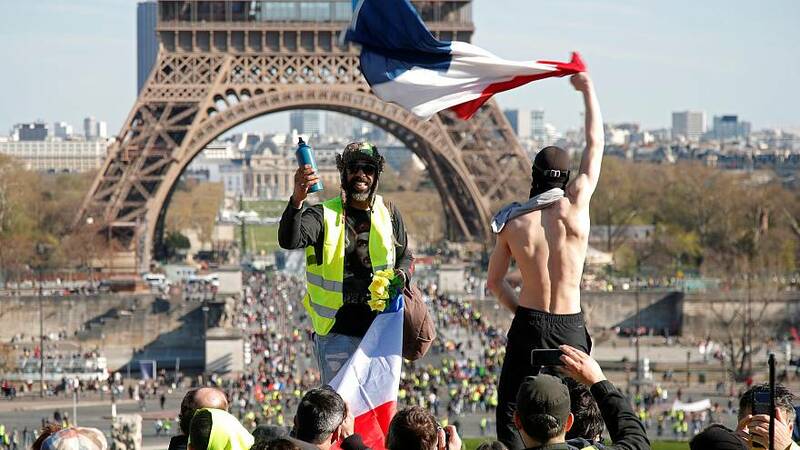 "It's always the same goal: social justice and the citizen's initiative referendum, especially when economic choices need to be made" added Jean-Edouard, 43, from the Paris suburb of Seine et Marne. Meanwhile, in a column published in Le Monde newspaper on Saturday, the French banking federation urged protesters to spare its branches, cash machines and staff. “We demand that our colleagues and sellers be able to do their job in safe and serene conditions to the benefit of their customers,” the federation wrote. More than 760 banking offices have been damaged since the beginning of the movement, according to AFP. The protests - named after the fluorescent jackets French motorists are required to carry in their cars - began in mid-November over plans to raise fuel taxes before developing into a broader revolt against the government that mobilized thousands of demonstrators nationwide each Saturday. The French government has attempted to respond to the movement by boosting support for low-income workers by some 10 billion euros and launching a 'great national debate' with citizens and local officials. Last week, Macron continued to meet with mayors as part of regional tours linked to the national debate. He is scheduled to end the tour Thursday on the Mediterranean island of Corsica.